My friends and sister are planning to see Finland in this month. Can you suggest me which hotels are best there to stay in Finland. And which places are attractive to visit in Finland? Please reply soon. I begin up above the arctic circle. If you then travel south you´ll pass the town of Santa Claus, Rovaniemi, where you should visit Santa claus workshop. Then youve got a lot of old towns along the baltic sea to visit. Like Oulu or Uleaborg(Uleatavern) that is a town founded by the swedish King Karl 9:th in 1605. In Oulu youll find 103 hotels>>>. You could find more about Oulu in oulutourism.fi. Down the roda youll then cross Vasa which is an old trading town. The town where founded during the middle ages and got a lot of history to tell visitiros here. You could read more about the ton in discoveringfinland.com. The a quick trip to Helsingfors or Helsinki which is the Capital in Finland. O.k, now I let you others gives more tips on travelling to Finland. Hi Björn,thank you for your contact. Arctic SnowHotel is located about 27 kilometers from Rovaniemi (about 30 minutes by car). We will open the snowhotel at least on 26th of December. We hope that we could get it ready earlier, but we can’t be sure yet, so we quarantee that it will be ready at least 26th of Dec.
Snowhotel accommodation is great and unique experience, but it’s not only for the accommodation. You can come and visit also there. You will see ice restaurant, ice bar, ice chapel, snowhotel suites (decorated rooms), rooms and we also show how the snowsauna works. Yes, you read right: sauna, which is totally made of snow and ice. I hope to get some more info from this place. BEST WESTERN PREMIER Hotel Katajanokka fulfills the expectations of travellers looking for an exceptional quality. Inside the old brick walls, a fascinating world of contrasts opens up; a modern premier-class hotel built in a historic prison setting.-The red brick walls house 106 magnificent and luxurious rooms. Stylish decor and unique atmosphere effectively take your mind away from the busy working day and intensive travelling. -In this peace and quiet it is easy to forget that downtown Helsinki is just 10 minutes away by tram. On foot the trip takes about 15 minutes. -Restaurant Jailbird is a relaxed and cosy restaurant for dining, located on the ground floor of our hotel. -BEST WESTERN PREMIER Hotel Katajanokka is a charming location to organize occasions, which fulfill the expectations of travellers looking for exceptional quality. Our unique milieu and atmosphere will make the occacions special and unforgettable. Joanna sent some interesting facts about this hotel. It is actually The oldest hotel building in Finland. 170 years old this year. Best Western Premier Hotel Katajanokka opened its doors in a historical prison milieu in May 2007. The oldest part of the building is 170 years old this year. The Katajanokka prison has also been called Skatta and Nokka, and the building enclosed by walls is a part of the historical Katajanokka. The name Katajanokka derives from its geographic location, the Skatan cape. The area remained a peripheral part of Helsinki until the end of the 19th century. In the 17th century there were only a few fishermen’s cottages, the Tullhäll brick works and a storehouse owned by the state on the rocks of Katajanokka. In the 18th century Katajanokka started attracting sailors and craftsmen. New sod roof cottages were built here and there. There were also taverns along the winding and narrow alleyways – and some of them housed vagrants and delinquents. The first prison of Katajanokka was built as early as in 1749 and went by the name of Helsinki Crown Prison. It was a wooden building with five rooms and a vestibule. In the year 1800, a new prison building was built on the lot. The new building was made of stone and could accommodate 20 prisoners. In 1837, yet another new prison was erected on the lot – the Helsinki County Prison – with 12 rooms for prisoners, two rooms for guards and a chapel that is nowadays the second oldest church in Helsinki. Later on the prison was extended so that the former prison building was converted into an administrative building with new prison wings. The barracks and the naval base of the Finnish naval equipage constructed in the 1820’s and the Uspenski Cathedral built on the highest point of the cape in the 1860’s contributed to the new face of Katajanokka. Before their time, the area had housed the school of old man Granberg, which was attended by, among others, Finland’s national writer Aleksis Kivi. Young upper elementary student Aleksis Stenvall, who was later to be known as Aleksis Kivi, lodged in the house of prison caretaker Windblad in the mid 1800’s. By then he had already displayed a literary talent. Kivi’s “robber play” was presented in the Katajanokka prison hall, and many in the audience had paid to see the play. During the 19th century Katajanokka began to gain status as a district of Helsinki. Architect Engel drafted a plan for Katajanokka as early as in 1832, but the plan was never realised because of the challenges posed by the rocky terrain. The project of building a channel to Katajanokka was realized in the 1840’s. The channel was to shorten the time it took to row from the South harbour to the North harbour. The first building plan for Katajanokka was approved in 1864. In 1879 a retired city engineer named Tallqvist was commissioned to draft a new plan for Katajanokka that would take into consideration the demands of trade and seafaring. The turn of the century saw a boom in construction and soon there was not a single vacant lot on Katajanokka. In 1888 a new county prison was built on Katajanokka. All the country prisons built in the late 19th century were based on a similar plan. These mostly red-brick buildings had a floor plan in the shape of a cross that was more or less symmetrical. The buildings had usually 3-4 floors. The Brick Gothic architecture of the country prisons was meant to look sinister from the outside and depressing in the inside. The county prison’s lot is 9,595 square meters in size, and the floor area of the building is 5,082 square meters. The Helsinki County Prison was damaged when Helsinki was bombed in the Continuation War. The north-eastern corner of the prison wall collapsed at a length of nearly ten meters in an air raid in 1942. The prison sustained another hit on 6 February 1944. That evening an aerial bomb exploded near the prison bakery, killing guard Johannes Tuominen and starting a fire. One of the people injured in the attack was writer Hella Wuolijoki, who had been convicted of treason. She described the night of the bombing in a book that was published after the war. After the bombing the building was reconstructed and modernised thoroughly, and the façade was not altered much until the prison was closed down. The Helsinki County Prison was a remand centre. Offenders were sent to Katajanokka from all around the Province of Southern Finland to wait for their trial. Remand imprisonment was enforced, if the impending sentence was expected to be more than two years. Katajanokka also housed default prisoners, who had not paid their fines. They were accompanied by regular prisoners and foreign prisoners on remand. The Katajanokka prison received some 40% of all prisoners transferred to Finnish prisons. Nowadays, the Vantaa prison built in 2002 has been charged with this function. Alongside regular prisoners, Katajanokka has accommodated also political leaders. In the 1930’s, Hertta Kuusinen, a staunch left-wing politician, spent a lot of time here because of her communist views. After World War II, many of the political and military leaders of Finland were sentenced to imprisonment. The most famous prisoners of Katajanokka included former president of the republic Risto Ryti and seven ministers Johan Rangell, Edwin Linkomies, Carl Ramsey, Väinö Tanner, Antti Kukkonen, Tyko Reinikka and Toivo Kivimäki, who were convicted of war crimes. The privileged status of these men was underlined by respectful treatment and exemption from hard labour. Risto Ryti is said to have noted, that “he has been in harsher conditions than those of the prison.” He was detained on Katajanokka during his trial from September 1945 to February 1946. The former politicians spent most of their time reading and writing. The most productive of them was Väinö Tanner, who translated four books, published three volumes of his memoirs, and also finished the manuscript for the fourth volume during his term of imprisonment. Not only was the political nature of these prisoners exploited, but some people wanted to make money out of it, too: one of the most novel attempts was by a fellow prisoner, who tried to sell autographs of the popular statesmen that he had gotten off signed package receipts. The societal changes from the late the 18th century to the 21st reflected in the everyday life of the prison. The facilities were modernised and the operations were relocated according to changing needs. Practical issues often produced creative solutions. For example in the 1930’s the prison yard always had dark nooks and crannies, because there were only a few lights dangling on the prison wall. The lack of illumination was compensated by a German shepherd that could better spot escaping inmates. The small ”mushroom” still found in the backyard was the only shelter the wall guard had regardless of the weather. An interesting tunnel construction exposed in 1946 shows how creative the prisoners could be: the wall between the men’s common space on the 3rd floor and women’s cell no. 13 had been broken through. The work had taken a couple of weeks. This simple product was different from all the known tunnels in prison and camp literature in that it was not meant to lead to freedom, but to the adjacent ward, where there were women! The well-being of prisoners received more and more attention in the course of the 20th century. In the 1940’s there were 14 walking booths in the backyard, where men walked in half an hour turns. Women were not subjected to walking booths, but could walk in a circle in the yard. The walking booths were removed in the 1950’s, and the prisoners were allowed to move more freely in the yard. The possibility of physical exercise was considered important, as were increasingly also pastoral care, education and edification. Prayers were held in the corridors of the prison every morning and evening. The prisoners were encouraged to study and to participate in group activities. In 1950 Nokka had a study group, a gymnastics and sports group, a singing club, an English club and a chess club. A choir of male prisoners assisted during the divine services. In 1967 the Helsinki County Prison started organising tours for groups, who wanted to see what life in prison was like. A variety of people participated in the tours, including schoolchildren and students. This had a positive impact on the atmosphere in the prison. Even the guards were pleased: transparency increased, but not at the expense of order. The Helsinki County Prison on Katajanokka was closed down in 2002. The closure of the prison had been debated for years, because it was felt that the prison no longer met the requirements of modern correctional treatment with regard to its structures and facilities. However, no one wanted to leave the building to decay, and hence it was to be placed in active use. The prison building, which is protected by the National Board of Antiquities and Historical Monuments, was assigned a worthy new purpose of use in May 2007. The former prison building now houses Hotel Katajanokka that provides its guests a historical surrounding for both sojourn and recreation. Jaana Veikkola, Helsingin lääninvankilan historiikki, Tummavuoren Kirjapaino Oy, Vantaa 1998. The Kämp Group hotels are located at the best spots in Helsinki center. Their luxuriously comfortable rooms and suites are both spacious and stylish, and the restaurant services are unequalled in all of Helsinki. Below you find information about our hotels located in the city center.You can find information about all Kämp Group hotels and restaurants here. 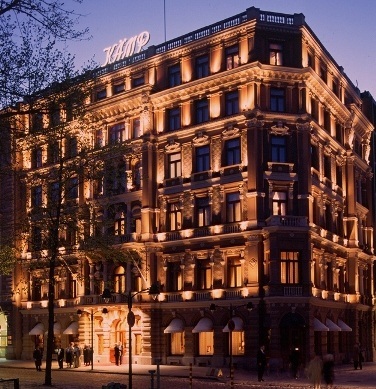 At Hotel Kämp, experience the luxury of timeless elegance and European glamour. In the spacious hotel rooms of the most luxurious hotel in Helsinki, enjoy your stay whether you’re on a business trip or vacation. During your stay you will enjoy all the first-class Kämp services to make your stay memorable. To us, excellent service is a matter of heart. We want to guarantee your stay is unforgettable. Find more about Hotel Kämp. GLO Hotel Art is a unique combination of a 1903-built Art Nouveau castle, with its variety of charming meeting and event facilities, and a new modern hotel. The hotel is located at the heart of the lively Helsinki Design District, just 700 meter from the city center. The stylish and modern 170 rooms of the hotel have been created together with Finnish designers. The individual needs of the customers have been taken into account when designing the range of services available for business visitors and families. Find more about GLO Hotel Art. GLO Hotel Helsinki Kluuvi is a modern lifestyle hotel in Helsinki centre. The most important idea behind this lifestyle hotel is to meet the needs of each individual guest by customizing the stay at the hotel. GLO Hotel Helsinki Kluuvi offers its guests a variety of recreational opportunities including sports, spa & sauna (extra fee), culture and dining in the hotel itself and outside its walls. 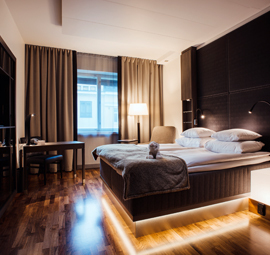 GLO Hotel Kluuvi offers sleeping experiences to all tastes in the centre of Helsinki. The hotel has altogether 144 rooms of which 64 are GLO rooms, 67 are GLO Deluxe rooms and 13 are Suites. The largest combination-suite available reaches an astonishing 200m2 in size. Find more about GLO Hotel Kluuvi. The Archipelago in south west of Finland offers you the luxury of space and time – time to think, time to feel, time to just be yourself. Its unspoilt natural environment is the perfect setting for all kinds of activity, whether you are seeking excitement or relaxation.The Baltic Sea archipelago offers extraordinary experiences. The rocky islands and islets with clear water bays offer unique surroundings for an action-filled trips. We will offer suitable accommodation for fishermen, groups and individual travellers. The rental cottages in the island of Berghamn comes with coastline, pier and a small motorboat of your own. You have immediately access to the best nature area and excellent fishing waters. A holiday in the island of Berghamn is the real way to see fascinating sites in the island area in all its variety. In the archipelago you are close to nature the whole time. Join nice swimming from the rocks and complete with Finnish sauna. There is also possible to choose traditional crayfish party in August and September. The island area in south west of Finland is a true paradise, with rich flora and fauna. This is the place to enjoy the nature, rare plants, listen to beautiful bird song and watch the seabirds at sea. – sport fishing, sailing tours, paddling school in sea kayaks, hiking, excursions to the Archipelago National Park – the island of Jungfruskär, birdwatching trips (we can introduce you to the delights of our local bird population). Join our sport fishing offer: casting for pike, perch, sea trout, whitefish and pike perch is especially popular. Read more in the Main menu “Outdoor activities”. Along the 3-km-long nature trail in the island of Jungfruskär you will see the oldest traditional landscape area of the National Park. There is a project in Jungfruskär focusing on development of sustainable nature tourism.